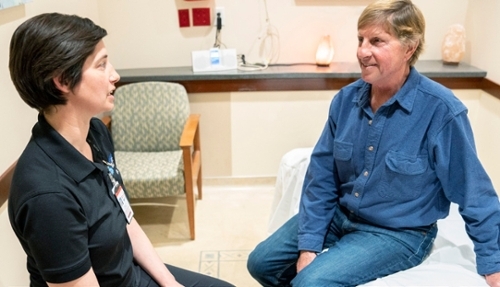 Molly Sullivan, a licensed massage therapist with HCI’s Wellness Center, talks with patient John Karg before his massage begins. John Karg was diagnosed with glioblastoma, a type of brain cancer, early in 2016. His cancer care team at Huntsman Cancer Institute (HCI) treated the cancer with surgery, radiation, oral chemotherapy, and participation in clinical trials. He’s doing very well with the treatment—his interview for this article happened while he was waiting for the lift lines at Alta ski resort. Standard cancer care focuses on treating the disease. Integrative medicine works together with standard treatments, with a focus on total wellbeing for the patient. The many forms of integrative medicine can help with cancer’s symptoms and side effects such as pain, nausea, peripheral neuropathy, fatigue, anxiety, and depression. John has participated in the Wellness Center’s POWER program. The program checks each participant’s physical fitness level, creates an individual exercise program aligned with the patient’s needs and cancer treatment, and provides personal trainers. “Their workouts helped me regain my strength,” John says. Other Wellness Center services have helped John with pain relief. He often gets acupuncture, massage, and osteopathic manipulative medicine (OMM) treatments. Acupuncture and massage are available to HCI patients and their caregivers at affordable rates. OMM is provided by a specially trained medical doctor, so many insurance companies cover treatments with the usual copay as the only out-of-pocket expense.